Click below on the link in the section of the book that you wish to download. 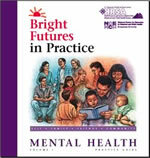 You may also download Bright Futures in Practice: Mental HealthVolume II, Tool Kit as PDF files. For help using PDF files, see Adobe® Reader®. Due to copyright permissions restrictions, this appendix is not available on the Web. Please see print version of the publication.